The board game Monopoly was released in the 1930s and its popularity has not diminished. Wagerworks brings to the reels the full complexity and excitement of the board game in the slot game Monopoly Here and Now. The symbols on the reels are taken from the board game. Properties, Utilities and Airports are represented. The highly value cards from Nine to Ace contain the game pieces. In addition there is the Monopoly logo. Mister Monopoly is the wild symbol and the Dice is the bonus symbol. There are three Free Parking jackpot meters that accumulate credits which may be won in the bonus round. Finally there are Property Deed sub symbols, which enhanced the value of the properties and allow players to win more credits in the bonus round. 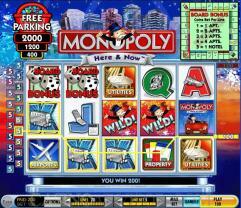 In Monopoly players can enable up to 20 paylines and wager up to five coins per payline. These can be selected using the indicators below the reels. The coin denomination is 1.00. 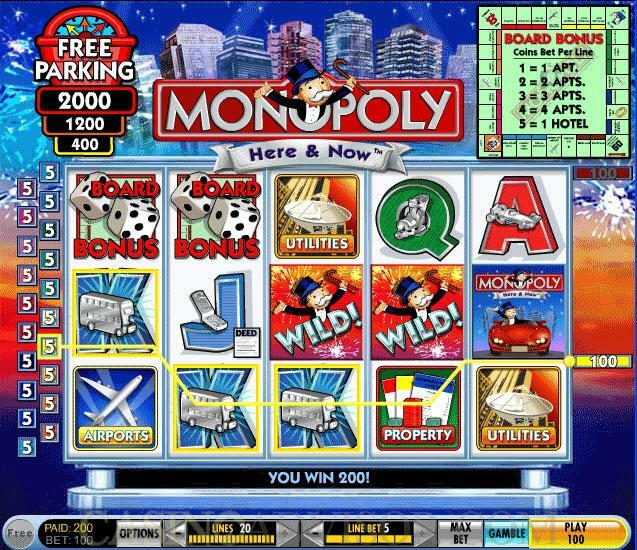 The Monopoly logo offers the largest fixed jackpot of 5000 coins. This symbol pays out even if it appears on the first reel. After every payout players can enable the Gamble game. 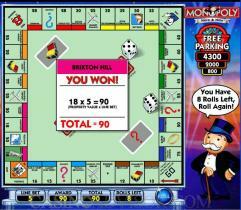 The highlight of Monopoly is the Monopoly Board bonus feature. When three or more Dice symbols are displayed in an active payline this game is triggered. The players have to pick one of the symbols and the dice rolls to reveal the number of moves the player can make in the bonus game. Mister Monopoly then takes the player to the second screen and while the Monopoly board is loading the player can choose the piece he will use in the game. Mister Monopoly rolls the dice for the player and the player moves along the Monopoly board accordingly. Whenever a player lands on a property he gets credits equal to the value of the property. In this manner the player completes the given number of moves and the accumulated credits get added to his balance. Two events on the reels allow players to accumulate value, which they may cash in the bonus feature if they are lucky. There are three Free Parking jackpots. Every time they appear on the real one of the three jackpots gets enhanced. 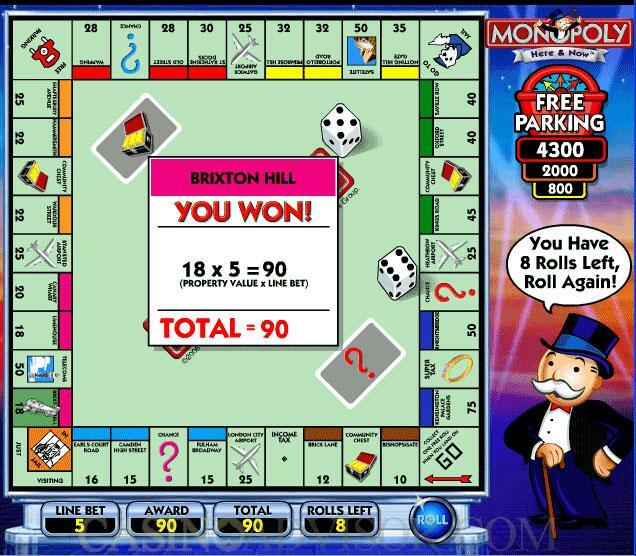 If the player lands on the Free Parking square on the Monopoly board then he wins one of the three jackpots. When the player draws three Property Deed sub symbols Mister Monopoly gives him the deed of any property randomly chosen and he builds apartments on that property. If during the bonus game he lands on a property with apartments he gets the enhanced credits. Other features from the Monopoly board game are also built in to this bonus round such as Chance, Community Chest and Go to Jail. Interested in reading more detailed information about Monopoly Here and Now? If so Click Here for more details.